Have I said that I’m sick of my couch? I have? At least 5 million times? Okay, sorry, but I really am sick of it. In fact, I will even go so far as to say that once I am all healed up and back on my feet, I will never touch that couch again! The next time I have to take cold medicine or something else that gives me nightmares, I will probably dream that I am being swallowed alive by that couch. My poor family, no one is safe now from all of my crochet projects! I’m so bored, you see, so I just sit around thinking of things that I can make. 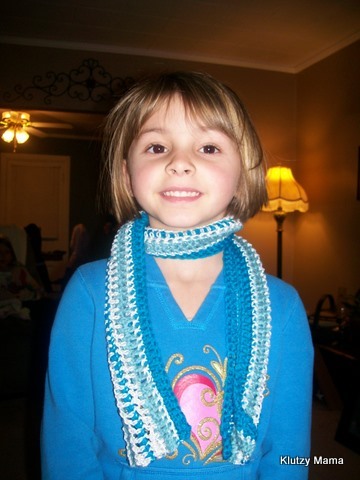 Today I made this scarf for Hannah. My mom got me the yarn a few weeks ago at Goodwill. I wasn’t sure what to do with it, but I decided today that I would make my little Nanner a scarf since she doesn’t have one. She loved it and I think it turned out well. You can find that pattern here. Because I was making it for a child, I only chained 120 instead of 274 in the beginning. And if you ever plan on making one for a child, I would say that 120 was almost not enough. If your child is 5 or younger, then it would be fine, but older than that, you’d probably want to increase to about 150 or so. I also used a size J needle and the yarn I used was probably a little bit lighter weight than what the pattern called for. But still, it turned out well, just not as bulky as the one pictured in the pattern. Aww, she is so cute. Look how happy you made her with that scraf. Good job mom! Super cute! I attempted to learn to crochet months ago, but never really stuck with it. Shannon, I had a real hard time in the beginning when I was learning. My husband made fun of me because I just couldn’t get it and it was sooo frustrating! But I’m glad I stuck with it because it’s very therapeutic for me. Very cute. We have been inspired by your creativity. Hope, Grace and I are going to try to sew some baby gifts for a friend who just had a baby. Cole, just came in and saw Hannah’s picture. He says “Hi” and the scarf is very nice. I wish I knew how to do that! I would be a scarf making fool! So cute. You should try to learn Kristi, it’s really a very relaxing hobby. You’d probably really like it. 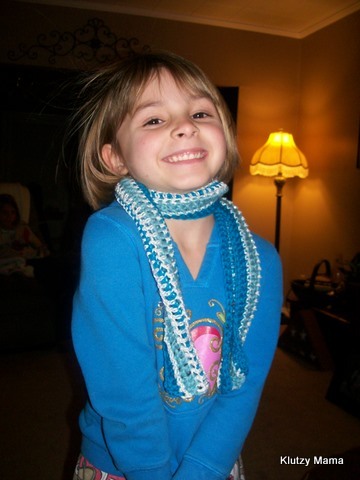 That scarf is too cute! Good job! I can hardly imagine how frustrating being stuck on the couch is. There will be no stopping you when you are up and around! That’s so pretty! (cute little one too!). I got so much yarn for Christmas, but it’s all cotton, so I’m going to make dishcloths until the cows come home! I never got into wearing scarfs, probably has something to do with the fact that I can’t stand all that bulk in the winter. But this year’s cold temps have me rethinking that. Believe me Becky, my sanity has been pushed to the very edge (I was already pretty close to it to begin with anyway!). I go to the doctor on Friday morning to hopefully have my stitches removed and I’m also hoping he will clear me to start getting around a little bit. I love that scarf. Nanner is adorable in it! I totally understand being sick of the couch, or bed in my case.